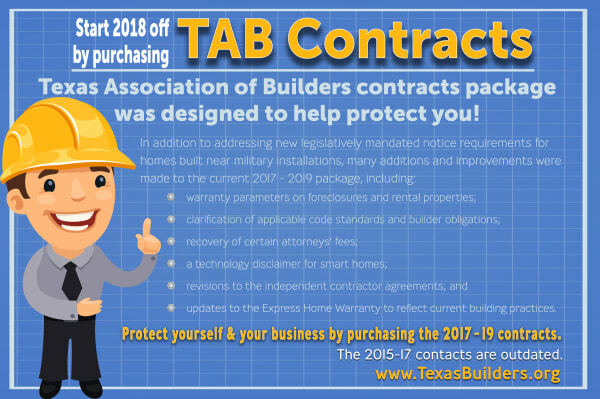 Texas Association of Builders’ Contracts Package subscription is available to TAB Builder members for only $399.99 (plus tax). It’s your blueprint for typical construction and remodeling transactions in the State of Texas. Click here to purchase the 2017-2019 Residential Construction Contracts. BUILDERS: You are required to abide by the requirements found in 29 CFR 1926 (OSHA Health and Safety Standards for the Construction Industry) as a minimum standard of safety. TAB’s Model Safety Plan and training webinar will provide you with comprehensive guidelines to help you train your employees regarding their responsibilities and to help you establish good safety procedures and systems for record keeping required by OSHA. Click here to purchase the TAB OSHA Safety Model Plan.